The Big Issue is trialling QR code technology that enables people who buy its magazines to sell them on and make more money for vendors. 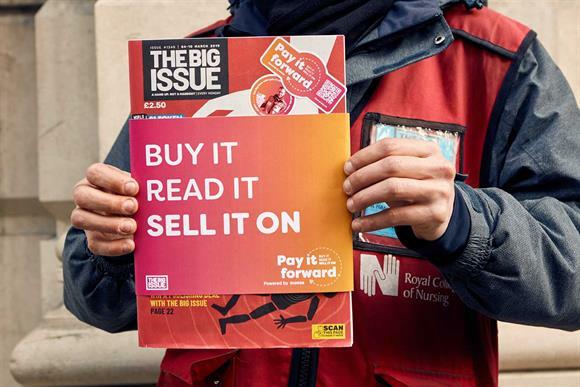 The social enterprise has enlisted the support of celebrities including Gary Lineker and Roger Daltrey to promote the initiative, which it claims makes The Big Issue the world's first resellable magazine. Each magazine has its own scannable QR code, which enables readers to pass it on to friends, who scan the code to pay for it again. The creative agency FCB Inferno devised the system, which is known as Pay It Forward. Vendors currently sell on average one magazine for every hour worked, and for each sale they earn £1.25. For the trial, up to 20 UK sellers have opened bank accounts that receive money from resells. Most banks require customers to have fixed addresses to open accounts, which is a barrier to many vendors. But Monzo, which is supporting the venture, does not. Lara McCullagh, director of marketing and communications at The Big Issue, said the scheme offered "vendors the opportunity to grow their income and their customer base". Aaron Dunn, who sells The Big Issue in London's Covent Garden, said one of his magazines had been passed around more than 20 times as part of the trial.